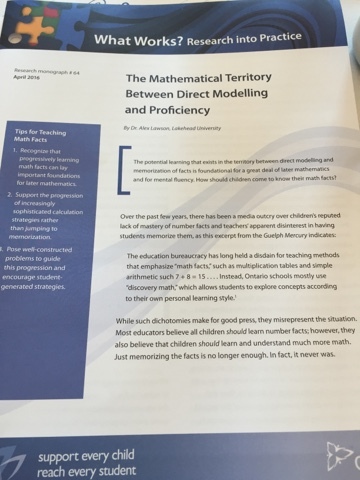 I had the pleasure of attending a workshop presented by Dr. Alex Lawson at the ETFO Math Conference this past weekend. 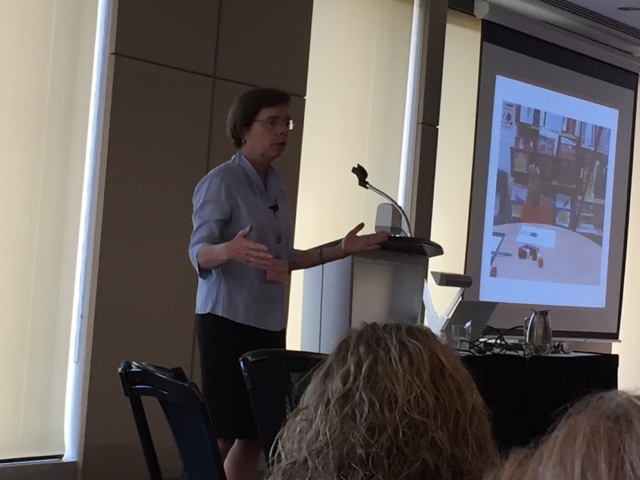 In addition to being a renowned expert in Ontario Mathematics I found Dr. Lawson to be a highly engaging and motivating speaker. Her ideas for enriching the mathematical space in the classroom and engaging children in higher level activities that embed a deeper understanding of and accuracy in computation were highly relevant. Dr. Lawson reminded me of the need for both child-guided exploration and explicit instruction when considering number sense in the classroom. 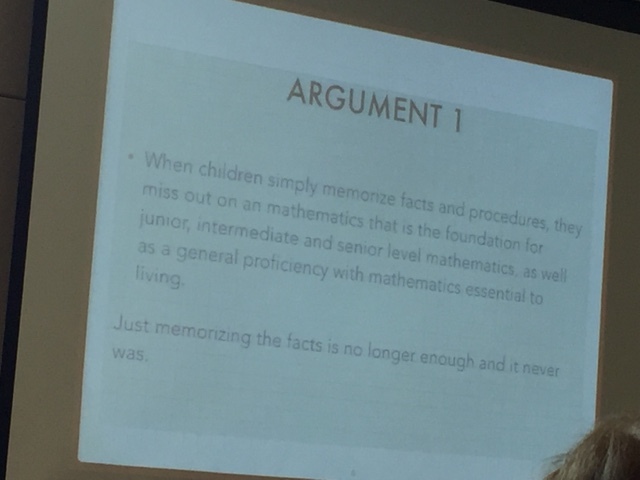 Dr. Lawson spoke specifically about the recent interest and discussion that has been explored in the press regarding the debate between children needing to memorize their basic facts and guided exploration leading to number mastery. For those interested she has written a Ministry monograph delving more deeply into this issue. 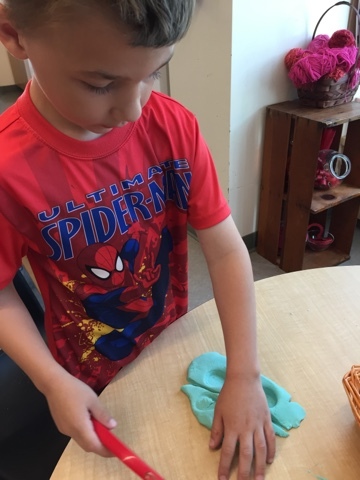 I found Dr. Lawson's discussion of particular interest because of the ongoing debate in FDK regarding just how much explicit instruction and guidance children should have in a playful, emergent program. 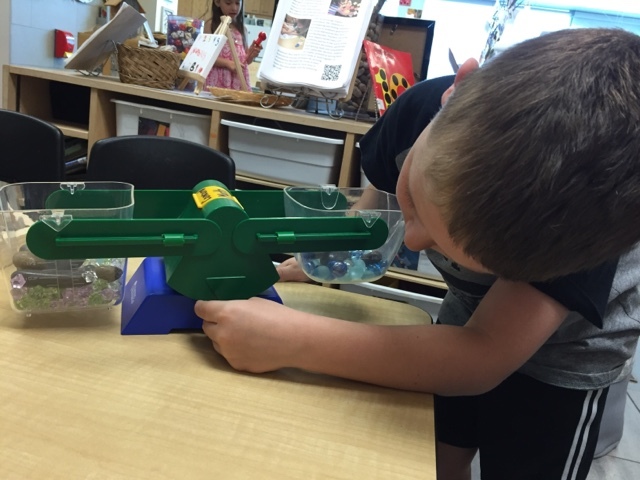 Many teachers wonder about the balance between guided instruction and open exploration. 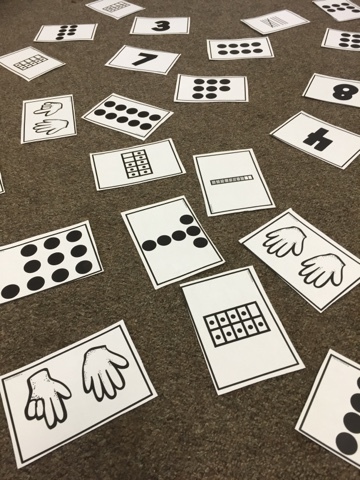 How might a teacher initiate and introduce a math concept that has not yet emerged in the children's play? What is the link between explicit instruction and small group practice? 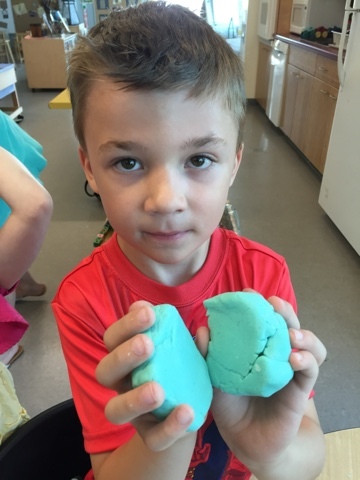 How can educators embed more meaningful math explorations into an emergent space? 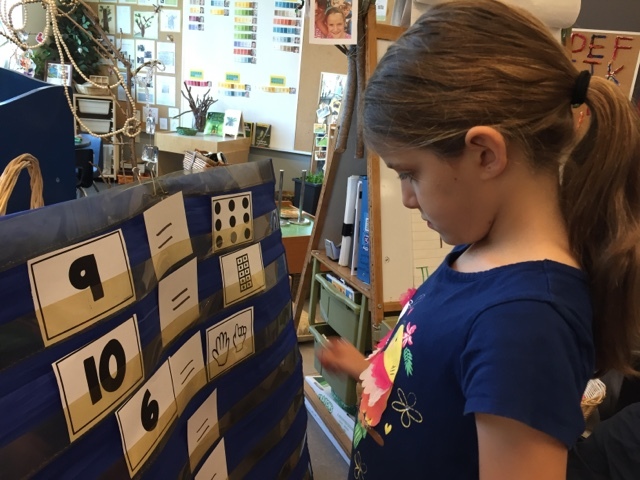 What strategies can educators use to ensure all children have access to robust math explorations in meaningful ways? 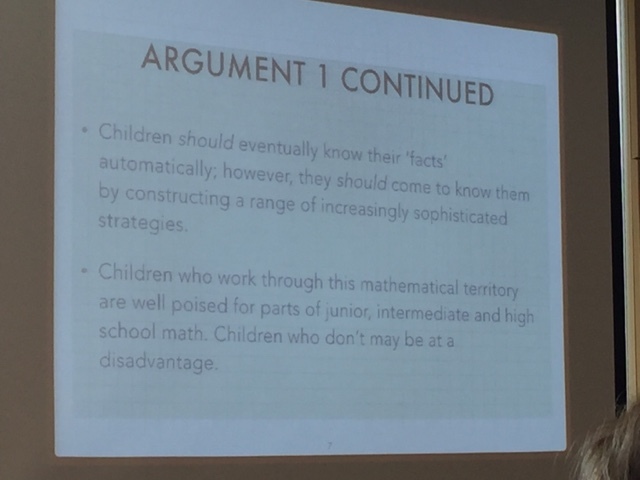 Dr. Lawson spoke specifically about the need for children to have rich, meaningful interactions within the classroom that promote an internalization of number sense, specifically computation, fluency, and accuracy. Memorizing facts and engaging in rote, didactic activities may help a child recall facts, but there won't be a deep understanding or flexibility when working with numbers and children won't necessarily know the 'why' behind the math. I was fascinated by the following slide that Dr. Lawson shared. When asked which equation was wrong, most children felt all were wrong except for the third. Why? They rationalized that it was the only equation written in what they perceived to be the correct format. 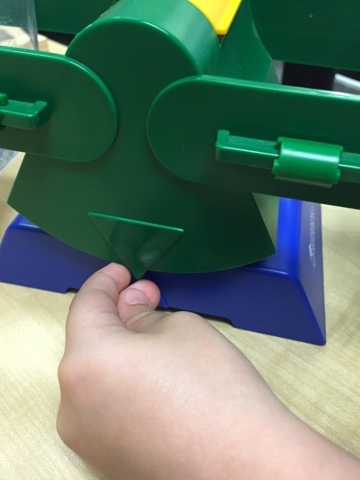 The children were thinking that the equal sign meant 'answer' and had not really internalized the concept that the equal sign represents that each side is the same as the other. They had memorized what they felt was the correct way to write an equation without understanding how the symbols and numbers worked together. This was troubling for me. When I returned to the classroom I wondered what my children would think if I presented the same question to them. I wrote four different equations and asked them which one was wrong. ﻿I was so pleased when many of them immediately pointed out the third as being incorrect. When I asked why, they automatically totaled the different addition ideas on each side of the equation and stated that both sides needed to be the same. "2 plus 1 equals 3 [is wrong]. It would have to be 2 plus 3 to equal 5!" 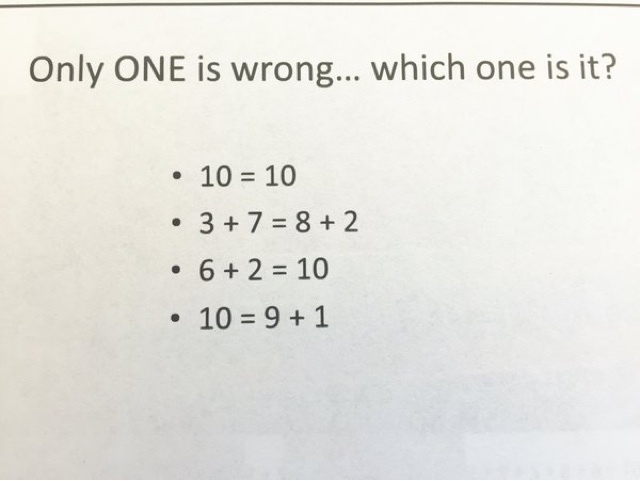 "The other ones all have the same numbers. 3 plus 1 is the same as 1 plus 3." "The last one is 6 for both sides." 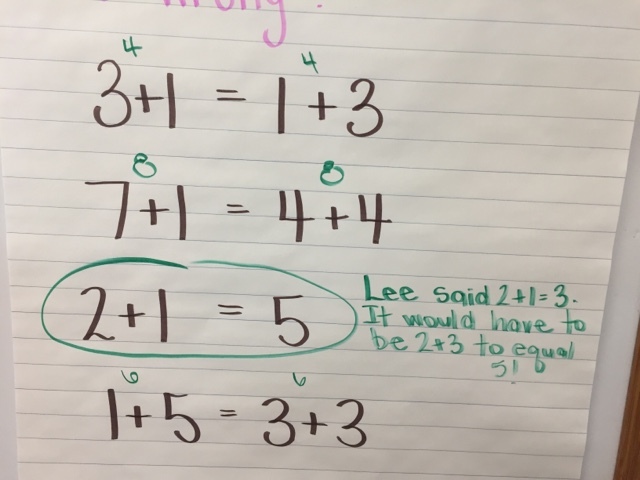 I was pleased that many recognized the incorrect equation but wanted to make sure as many children as possible had entry points into thinking about the idea of equivalency and knowing that each side of an equal sign needs to be the same in order for the statement to be correct. I asked the children to sit around the edge of the circle and placed a set of subitizing cards in the middle. The cards show different ways of representing numbers (numerals, dots, ten frames, cubes, fingers, etc.). 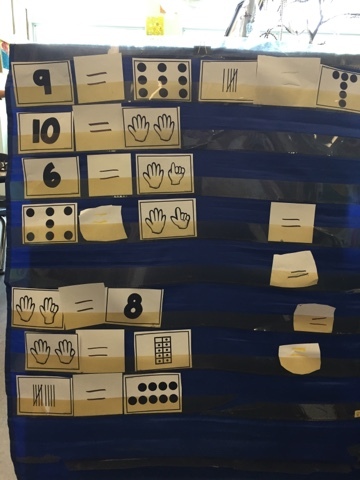 In our pocket chart I placed a number of equal signs and asked the children to consider how they might organize the subitizing cards. 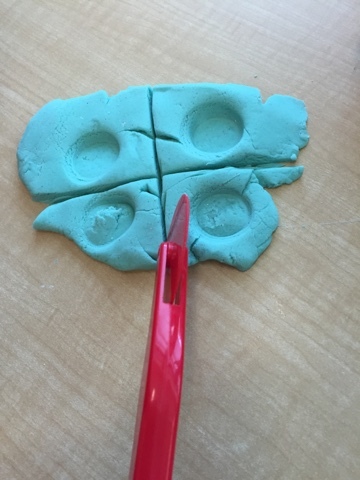 A number of children demonstrated how they could use numbers in different ways and placed the equal sign in the middle to show these were the same. 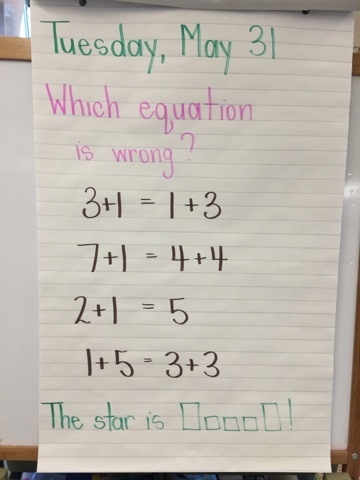 This generated a lot of interesting conversation as children debated the numbers. I'm hoping to revisit this idea in another few days and encourage the children to add addition or subtraction signs on either side of the equal sign so they are composing and decomposing numbers yet making each side balanced and equal to the other. 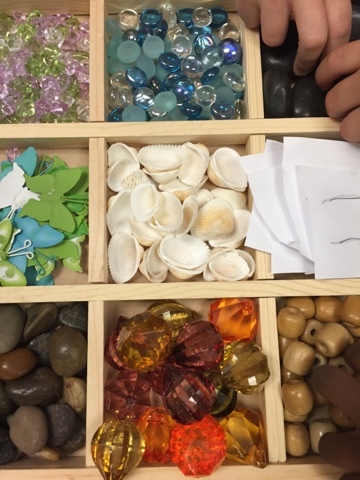 This activity was available for the children to revisit and explore during our next large play blocks. Many children wrote their own equal signs and used these as well. Many children were drawn to the interesting materials. 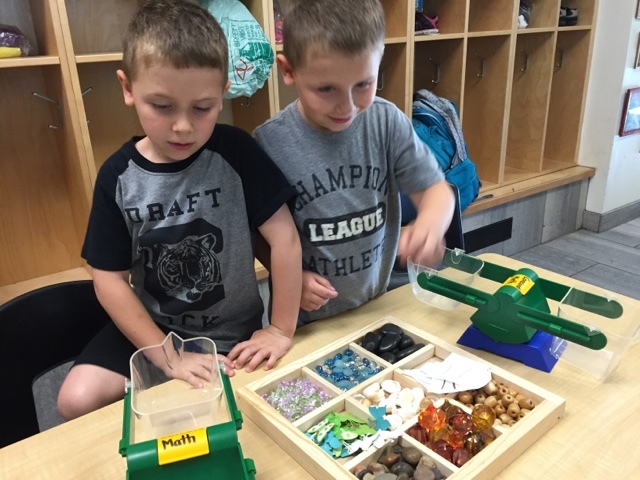 They were curious about what the scales were and how they worked and spent much time with open ended exploration. "Look! I know when they are equal! These arrows need to be in the same place!" After open ended exploration with this concept the children shared their thinking in the next whole group circle. 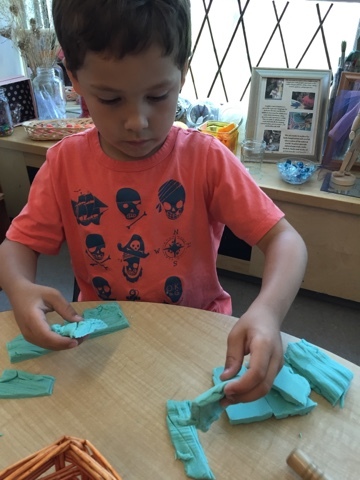 We named the learning and shared math terminology to help the children engage in meaningful conversations the next time they visited the materials - balance, level, and weight were especially important math words to hear and learn. We began to notice an interesting thing during the next play block. Many children were exploring the idea of being 'equal' using different play props and ways of measuring materials. "2 parts can come together to be a whole." "I have equal slices of pizza so all the friends have the same to eat." "4 equal slices of pie to eat too!" It was so interesting to see how the children interpreted our initial conversations of what 'equal' meant and applied their understandings to new and interesting play situations. We heard many conversations today and noted that some children were beginning to use language that described fractions - this is especially interesting as fractions are one of the topics most children have difficulties with. 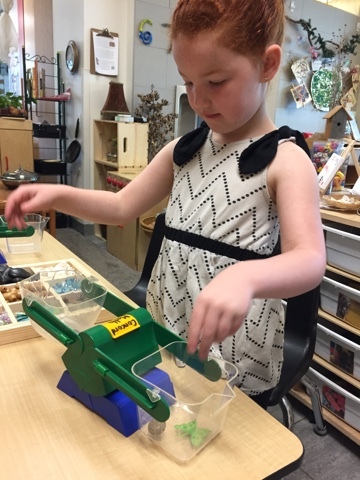 If kindergarten children are becoming comfortable using rich math language in the appropriate corresponding context, their mathematical mindsets will flourish as they see themselves as capable and invested mathematicians in the classroom and beyond! These are great activities to help the children understand the concept of equal. Children need a lot of hands-on experiences to fully understand concepts before moving them on to the abstract interpretations. Understanding, and lots of practice in applying the concepts in different situations, aids the ability to recall. 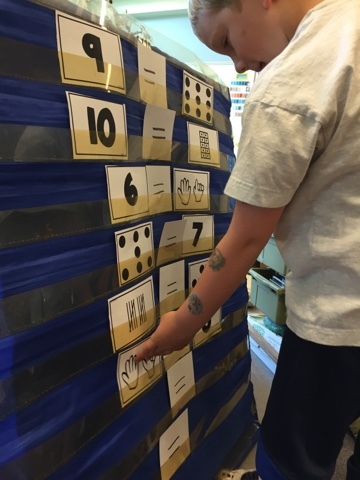 If they can visualize the number, concept, or process, they will more easily be able to word effectively with it.